What could be better than a lifted, big turbo, E85 Volkswagen wagon?! 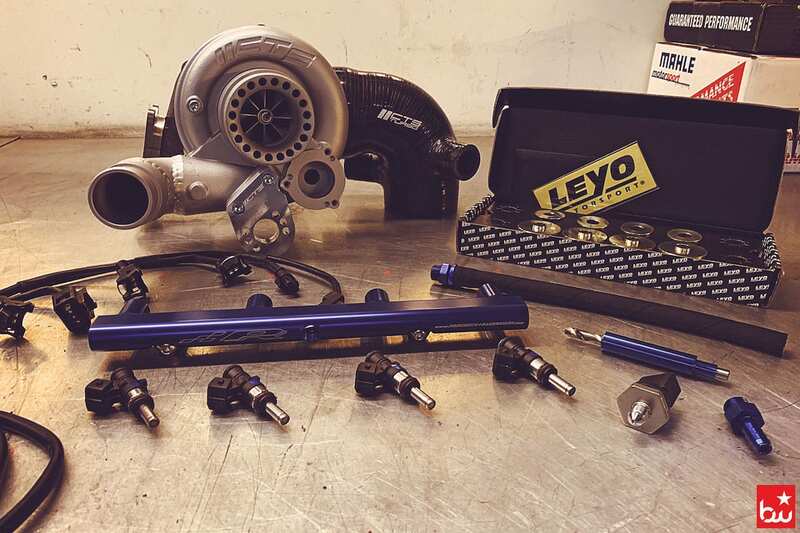 When the Bluewater Team heard VW was releasing an AWD turbo wagon, we were ecstatic. This was even before we learned it was going to be a lifted, off-road version based off the new MQB platform. What would be a more appropriate vehicle for our Colorado roads and weather? Enter the 2017 Volkswagen Alltrack: with a turbocharged 1.8-liter motor, 6-speed DSG transmission, and the Haldex all-wheel-drive system. It was supposed to be a winner. Unfortunately, and for whatever reason, the US market does not want to buy wagons, preferring small SUV platforms. Despite its lack of popularity, Jaryd, our front office guy, could see the possibilities. 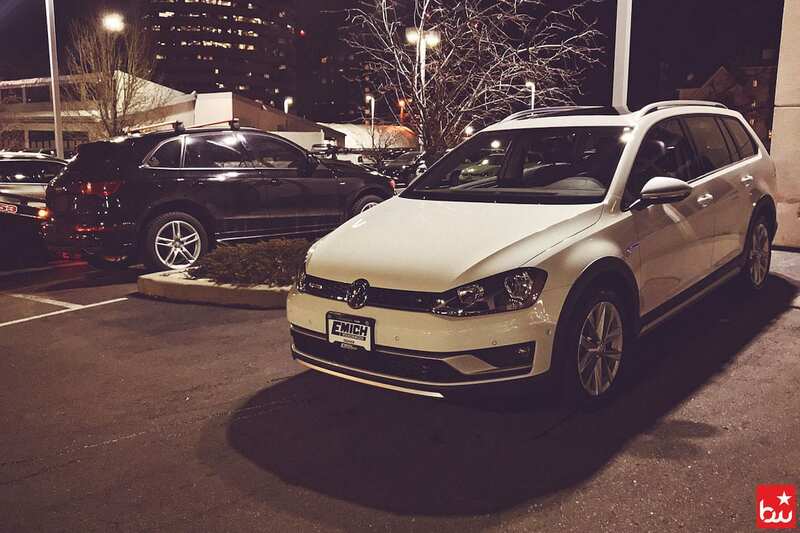 Jaryd secured his Pure White Alltrack SE in February of 2018, but it wouldn’t be easy: he’d be giving up his current daily. A Stage II Audi Q5 3.0T that would run low 13s at Bandimere. The whole team was sad to see the “Queefer” go, but we all knew Jaryd had a secret plan for the Alltrack to be bigger and better. Naturally, the Alltrack didn’t stay stock for long. Since the Alltrack was so new, there wasn’t much information or aftermarket parts available. 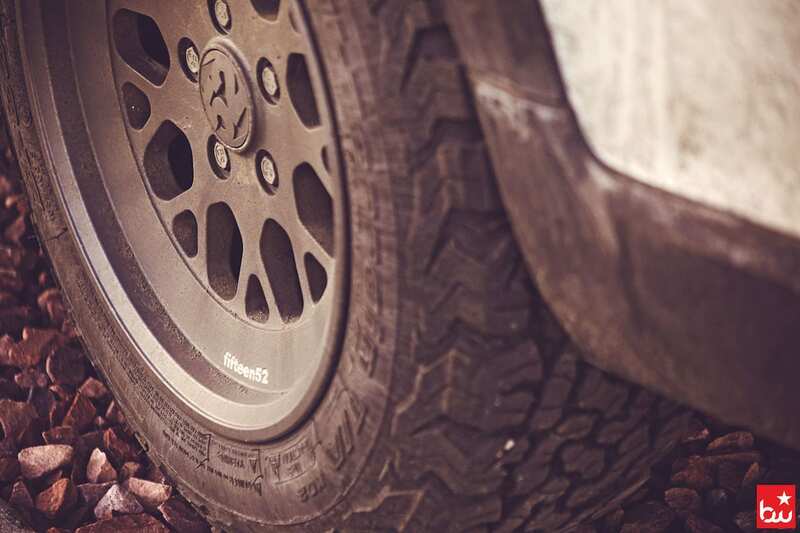 First and foremost, some beefy wheels and tires were needed. 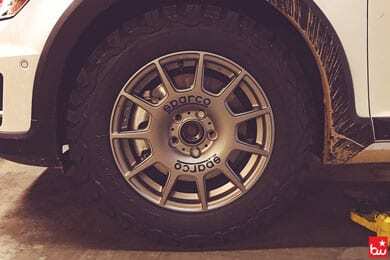 Jaryd initially went with 16x7” Sparco Terra wheels and BF Goodrich K02 All-Terrain wheels in a 215/65/16 size, but they wouldn’t last long. “Ultimately, the Sparco’s didn’t complete the look for me," Jaryd shares, “I wanted something a bit more unique. 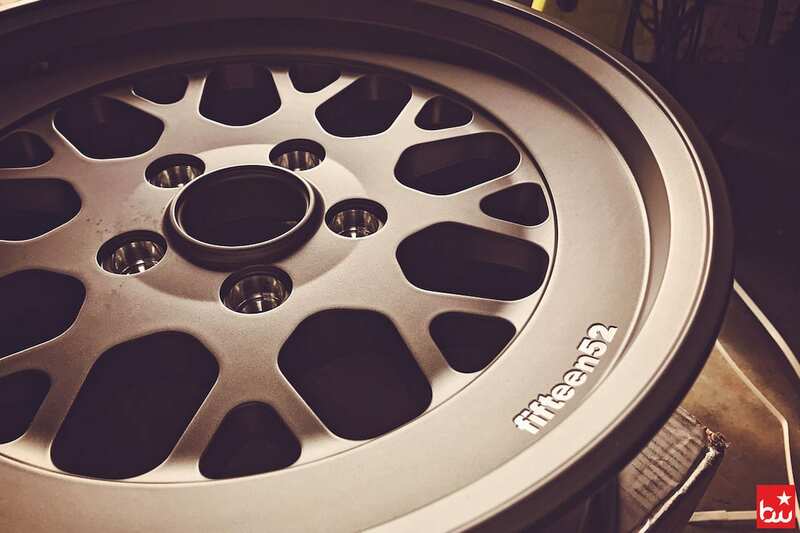 That lead me to look into Fifteen52 Formula TR wheels (currently unavailble from their U.S. store). I liked these for a couple reasons: the wheels only came in 5x114.3, so not many people would run them, and because I could get them in 16x8” with any offset. I wanted something aggressive, but not poke-y. So I went with an et30.” The larger tire increased the rolling diameter by roughly 2” filling up the available space in the wheel well. 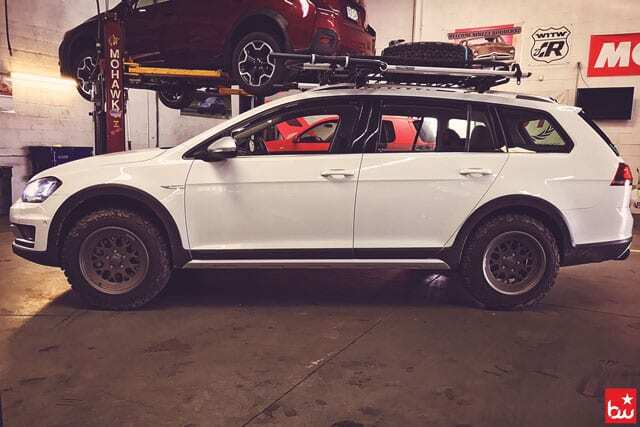 That roughly translated into a .5” ride height addition, helping to give the Alltrack a slightly lifted look over stock. Wheels, check. Now time to get some additional ride height. Forge Motorsport was first to the market with a Suspension Lift Kit. 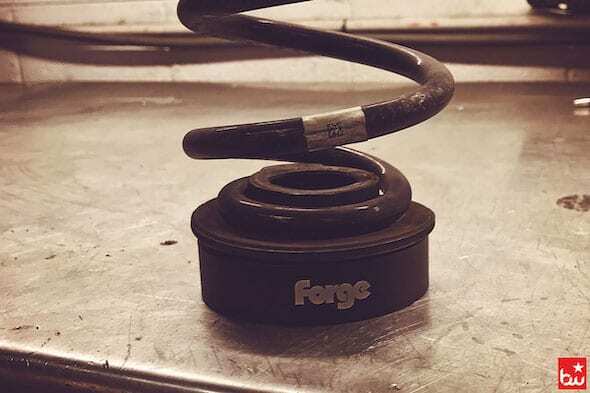 Forge created a strut top spacer in the front, and a spring spacer in the rear. It’s a fairly simple kit that just bolts on with no issues and no modifications needed. 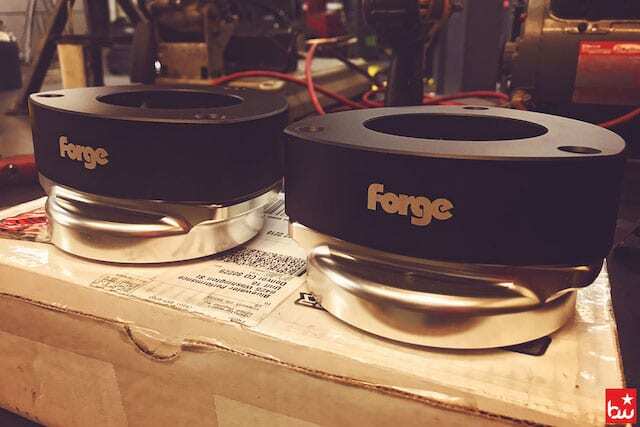 Soon our technicians realized the Forge lift kit wouldn’t fit properly with the 034 camber plates, so an additional modification would need to be done. 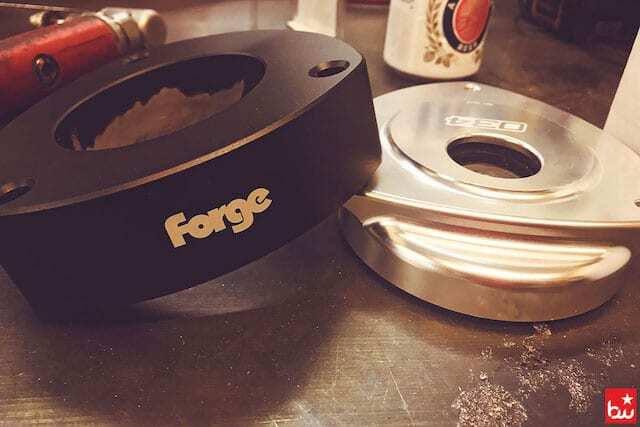 The Forge front lift spacer needed to have a larger center diameter hole to clear the larger 034 center. After a lot of grinding and a few broken drill bits, Jaryd finally got the clearance he needed for the plates to fit together, and the install commenced. "Don't judge my hack griding job, nobody see's this part and it didn't need to look pretty." The Forge Lift kit added about 1.5 inches of additional clearance. Overall it looked great, but something was still off. “I kept thinking to myself, the rear looks lower than the front… and others seemed to be noticing too. 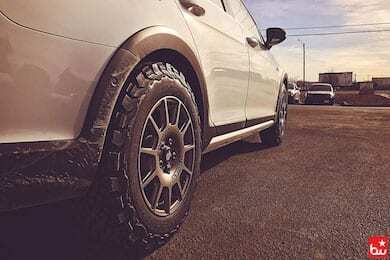 In actuality, the body lines of the car are throwing your eyes off, but the ground clearance is equal.” Once you add some snowboard or bike gear in the car, with rear-seat passengers and it became even more pronounced. 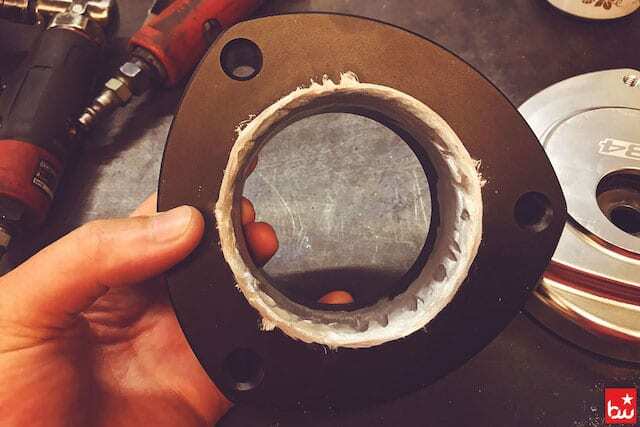 Jaryd reached out to Forge and was able to get his hands on the rear Atlas spring spacer they just developed. 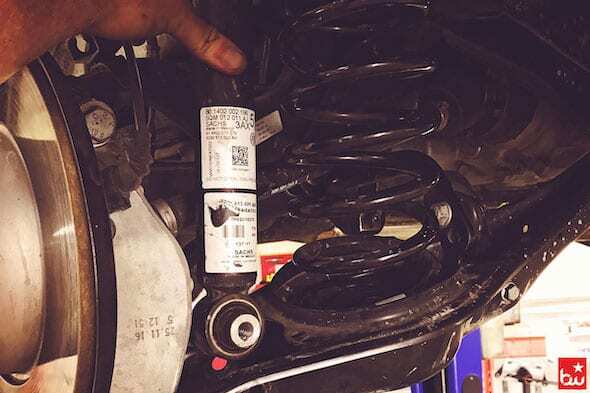 It soon became apparent that the rear Alltrack shock was the limiting factor, as it did not have enough travel height to accommodate the extra spring height. 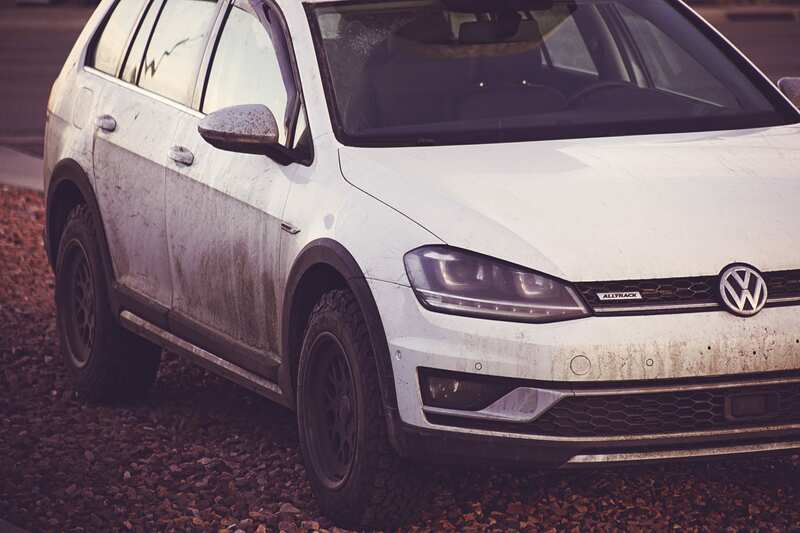 After a few trials with Tiguan and Atlas shocks, the Atlas proved to be the winner, providing a beefier shock and about a 1.5” additional travel. However, a slight modification was needed to the upper strut mount in the rear due to the larger shock. Now it sits perfectly! 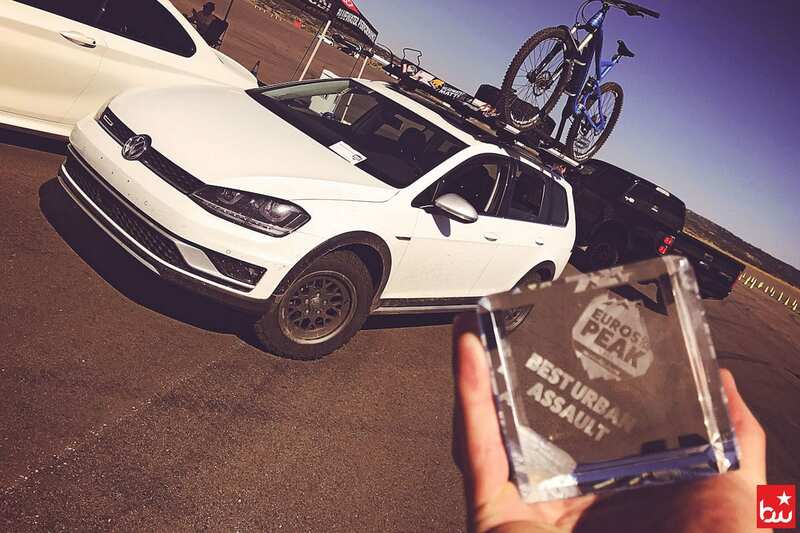 Jaryd even snagged the title of ‘The Best Urban Assault’ vehicle at the 2018 Euros on the Peak car show held by Denver’s local European car club, AlphÆuros. 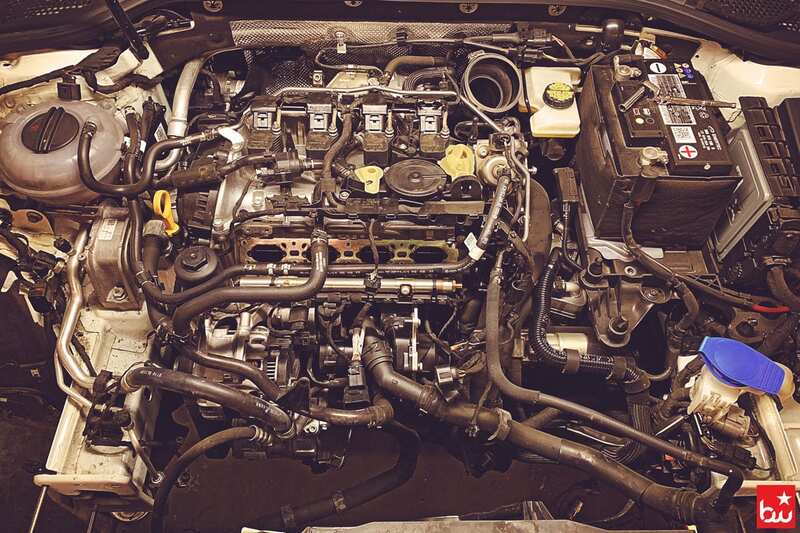 All of this work, and Jaryd was not yet satisfied— the Alltrack was still too slow. The 1.8T that came stock in the Alltrack (and all Golf/Jetta/A3 vehicles in general) is lethargic at best. Even though it’s claimed 170hp and 200tq at the crank, the added weight of the AWD 4Motion system makes it sluggish. Combine that with long gears, it’s 0-60mph time is a leisurely 7+ seconds. 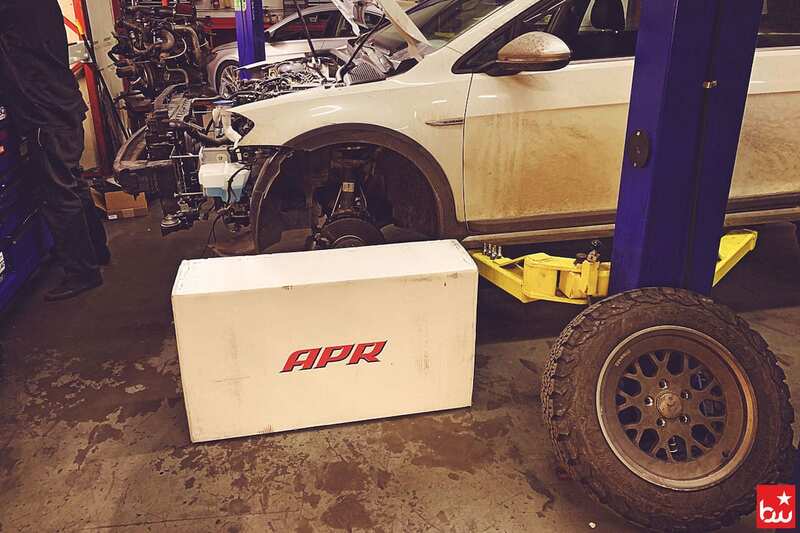 APR was one of the first companies to the market with ECU & TCU (DSG) software upgrades on the market. Soon enough, Jaryd was here after hours, installing some aftermarket goodies. 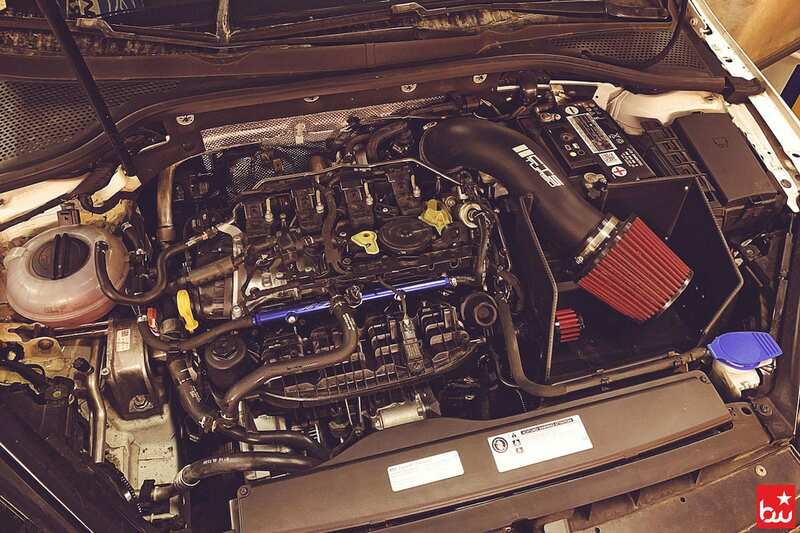 First came a CTS Turbo Intake, APR Cast Downpipe and APR Stage 2 ECU & DSG software. 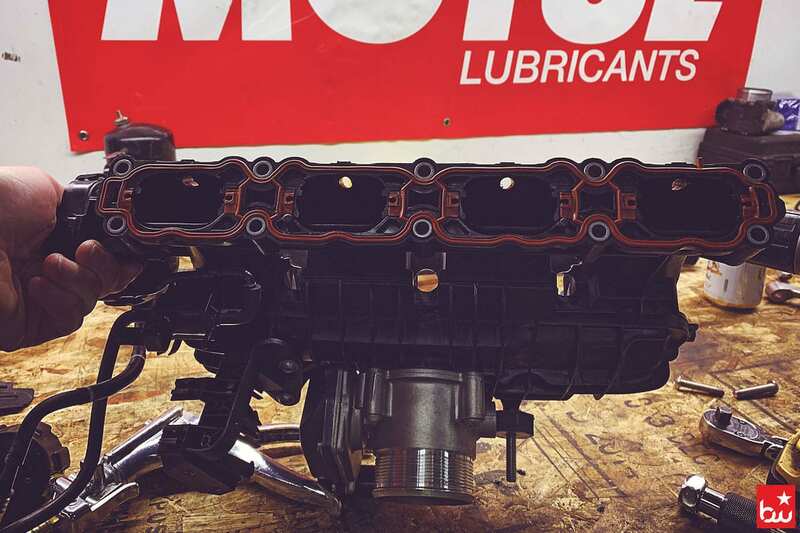 “The intake, downpipe and tune really helped open up the 1.8T motor," said Jaryd. “It’s quicker off the line, gear shifts are faster and more engaging, plus the extra power and torque is great for driving in the Mountains.” Still, it was too quiet for Jaryd’s taste. Even with the APR downpipe, the Alltrack was just silent. Enter AWE Tuning. AWE was the first company to come to the market with an upgraded cat-back exhaust for the Golf Sportwagen and Alltrack. 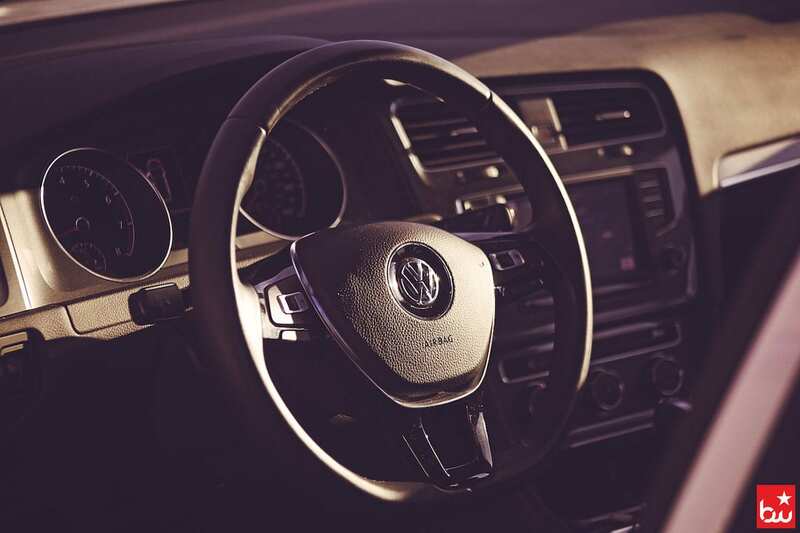 Yes, they’ve had systems for the 1.8T Golf already, but the Sportwagen and Alltrack are unique because of the AWD system and single tip, dual outlet exhaust system. Purchased, and installed. 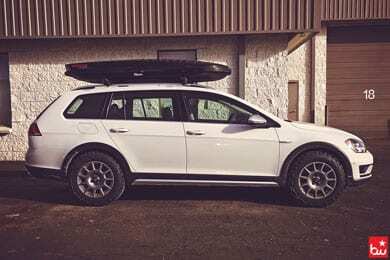 Not the first Alltrack with the AWE Touring exhaust system, but one of them. Side note - this exhaust was designed for a stock downpipe vehicle. So it screams with any aftermarket downpipe. Stop on by the shop, and Jaryd will gladly rev it up for ya. “It’s just not enough!” Jaryd kept telling all of us. 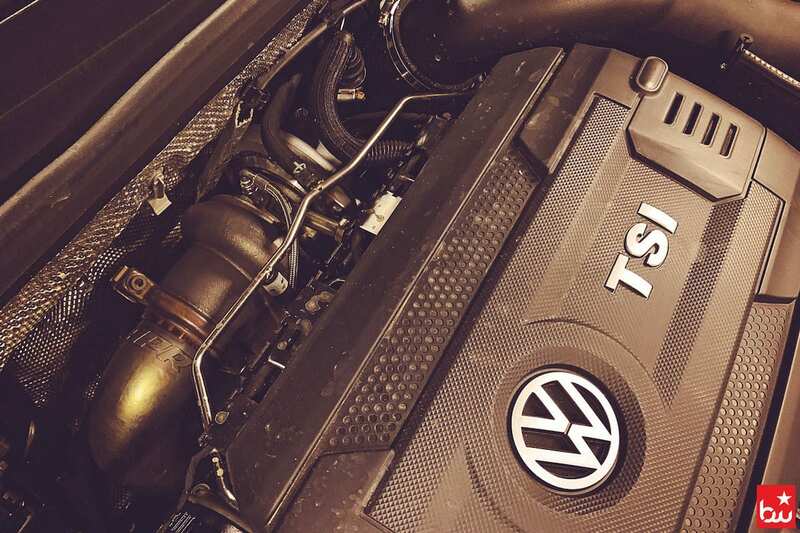 We’ve had a lot of opportunities to big turbo the 2.0T motor from the GTI/R/A3/S3, so we knew what they were capable of at least that much. 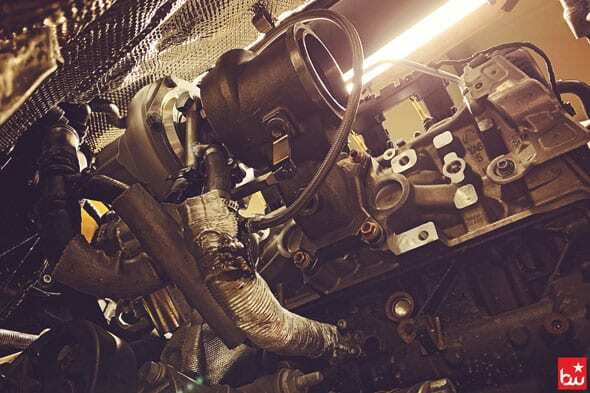 Despite our experience with the 2.0T motor, the Gen3 EA888 1.8T motor was so new that nobody had gone down the route of installing a big turbo to verify it would fit. Plus, there wasn’t any software available. Sure, APR has IS38 software, but Jaryd wanted to go bigger if the turbo was being replaced. 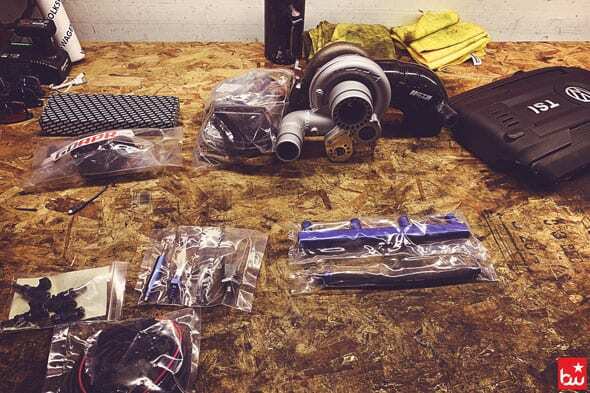 Searching for turbo kits was exciting, yet frustrating. No one could verify they would even fit the 1.8T motor. CTS Turbo, HPA, APR, Iroz… all possibilities, but no solid information. 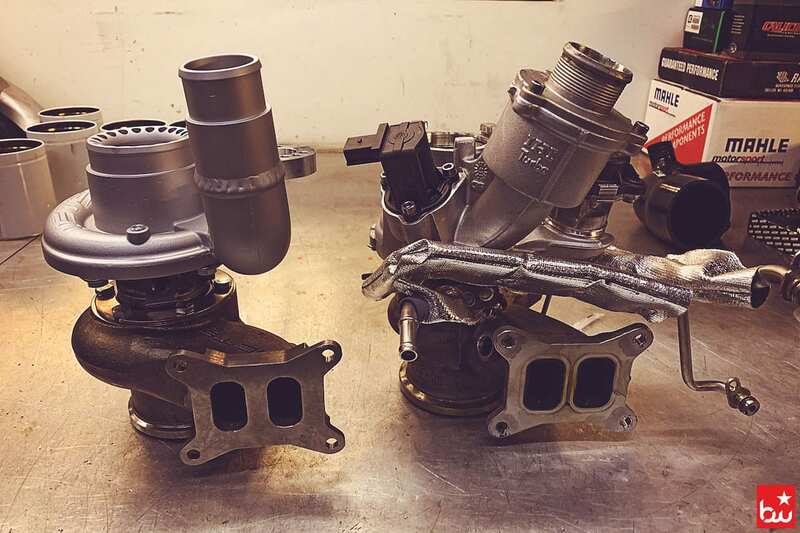 “My goal would be to have an upgraded turbo that still spooled quickly at our altitude, but would be able to hold decent boost all the way to redline,” said Jaryd. 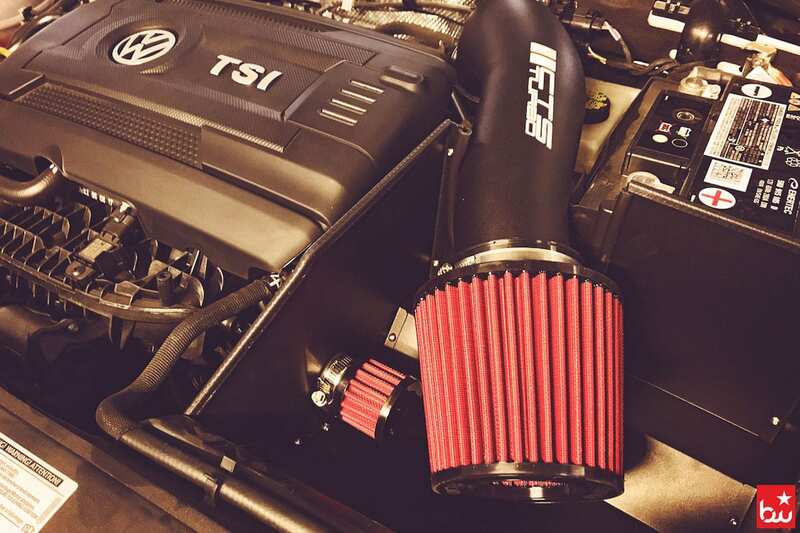 By this time, we had installed quite a few big turbos on various GTI, R and S3 vehicles, including our own shop car - 2015 S3 with the APR Stage 3 EFR kit (no longer with us). They all had their differences. The CTS Turbo Boss500 and 600 kits were inexpensive and made crazy boost numbers, however didn't spool the fastest. But a version 2 was on the way, and it promised better spool and overall performance. We eventually narrowed it down to finding a used EFR or going with the new version Boss500 kit. Ultimately it came down to the Boss500! Essentially, the CTS Turbo Boss500 Kit is a GTX2867R turbo with supporting hardware. It is a direct bolt on application that utilizes OEM hardware and OEM downpipe sizing. Part of the reason why their kit is not as expensive: you don’t need a bunch of custom items to install/use it. Luckily, as we had hoped, the 1.8T motor is virtually identical to the 2.0T. No additional or custom hardware was needed. 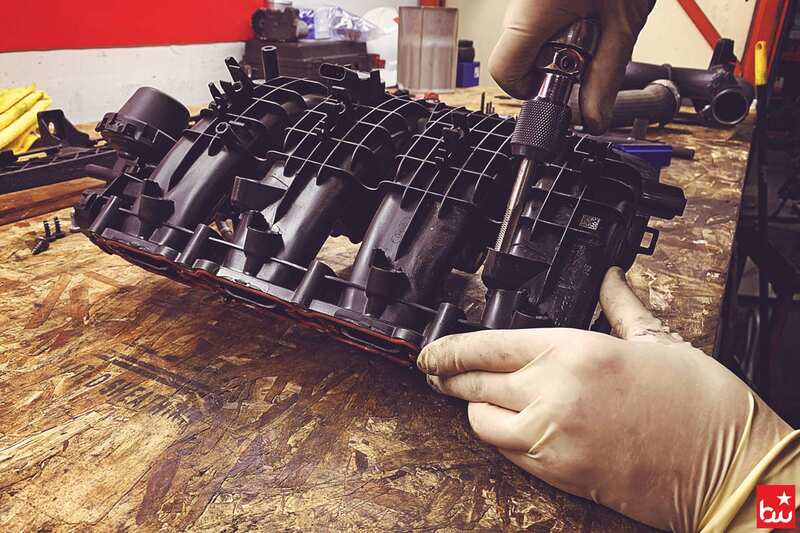 The process is simple: unbolt the turbo, and bolt the Boss500 kit in. 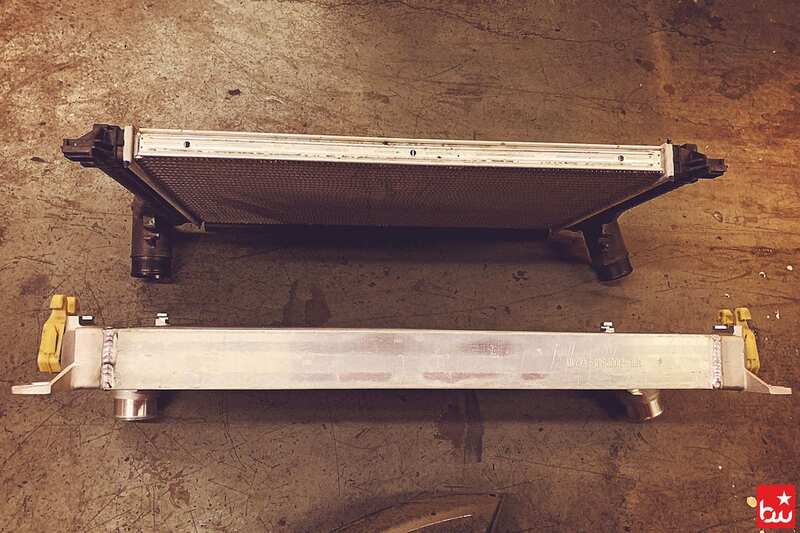 Of course we had to add an APR intercooler to make sure everything stays cool during the summer heat. “My other ‘want’ was being able to run E85 fuel. It made such a huge difference in my GTI, that I knew 91 octane wouldn’t cut it for me.” Jaryd also has a 2006 GTI that he uses for track, autocross, time attack events. You may have seen that car around HPR or at the PPIR Time Attack events — even placing in the top 1 and 2 spots three years in a row! E85 is such a unique fuel. It burns cooler, is cheaper to purchase, can make more power, but requires more frequent fill ups. Actual mileage per tank is TBD, but totally worth it. United Motorsport had FlexFuel options for the 2.0T, but had yet to create any sort of file for the 1.8T. United Motorsport was up for the challenge, and Jaryd switched software companies. 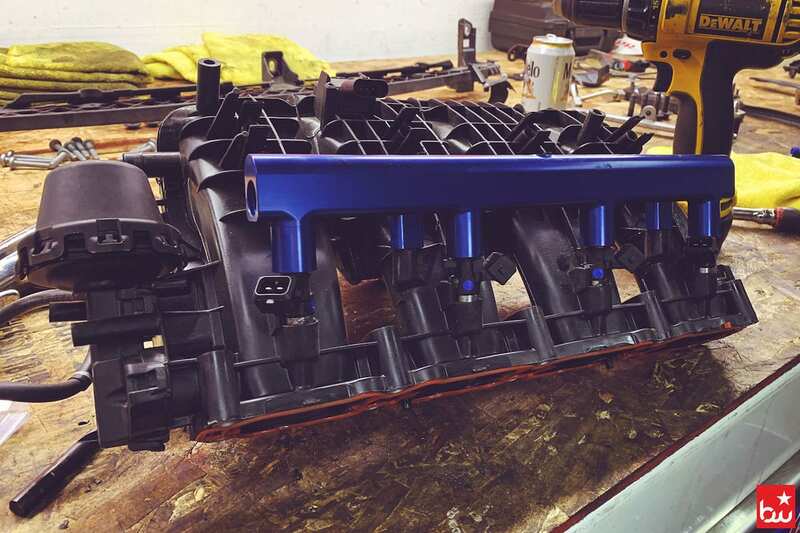 In addition to the Boss500 turbo kit, we needed the following to complete the fuel system: Precision Raceworks Port Injection Fuel Rail Kit with 4 additional 925cc fuel injectors, and their stage 3 low pressure fuel pump kit. This would ensure that proper fuel pressure and supply would be there for all the E85 requirements. Our technician, Alex England, was so excited to hear about this project that he graciously volunteered his weekend to get everything installed. It took him and Jaryd a good solid two days to get everything bolted up properly and to make sure there were no oil, coolant, or boost leaks. Some small items had to be modified, but nothing too crazy. No major issues arose. Our team was excited to see that everything bolted up without any issues. Forward to today. Jaryd has the 1st ever FlexFuel/E85 big turbo Volkswagen Alltrack. We’re still ironing out some ECU and DSG hiccups, and have not ran it on a dyno yet. But stay tuned, this is an ongoing build, and we will keep updating! Big thanks to all the companies who have offered advise and created amazing products for the Audi/VW platform. Interested in something like this for your own car? Give us a call and ask for Jaryd! Find Jaryd on Instagram & Facebook and to see more projects from Bluewater Performance follow us on Instagram & Facebook as well!